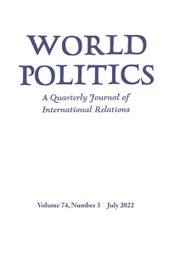 World Politics, founded in 1948, is an internationally renowned quarterly journal of political science published in both print and online versions. Open to contributions by scholars, World Politics invites submission of research articles that make theoretical and empirical contributions to the literature, and review articles bearing on problems in international relations and comparative politics. The journal does not publish articles on current affairs, policy pieces, or narratives of a journalistic nature. Articles submitted for consideration are unsolicited, except for review articles, which are usually commissioned.